Gone Home still comes up now and again in conversation. Depending on who you ask, it was either an amazing and emotional experience, or a walking simulator. It was one of the games I had in mind last week when I talked about the disconnect between critics and their audience. I thought I'd dig into it this week as a good illustration of the thing I'm talking about. Gone Home takes place in 1995. In it, you explore a house, read letters, and examine objects to figure out where everyone is and what happened to them all. There's no combat and no fail states. No "Game Over" screen. (Hence the "Walking Simulator" label.) To get anything out of the game, you have to find something interesting in this core experience. The gameplay consists of picking up objects and examining them. The game is filled with hundreds of exquisitely detailed curiosities from the past. As I played I was constantly sucked back to my teenage years, remembering things that I owned and used on a daily basis. Things that I haven't seen or thought about in the two decades since. The game showed me all sorts of teenage artifacts. Not just inert objects, but precise re-creations that captured all the little details of an object. The way a cassette tape case flops open. The sound a locker makes when you shut it. The dog-eared edges of a book cover decorated with ball-point pens. When we talk about a time period, we tend to focus on the big, obvious superficial details. If we were talking about the 80's, then you can probably name all the fixtures of that time period even if you were born in the following decade: Big hair. New-wave music. Polo shirts with popped collars. Neon colors. But that's not really "The 80's". That's movie shorthand for "The 80's". That's the Disney theme park version. Actually nailing down a time period in a way that resonates with people who remember it is supremely difficult, and Gone Home nails it with countless small details: Furniture, wallpaper, technology, calendar art, fridge magnets, fad-driven book genres, food packaging, carpeting, teenage lingo, lighting fixtures, kitchen appliances, and countless other things we don't think of as being part of a time period until we see the old contrasted with the new. Gone Home blew my mind. I graduated from high school in 1990, so I'm just a little older than the protagonist of Gone Home. Half the objects in the game activated some gut-punch memory for me - some strange moment of temporal vertigo where I suddenly saw the past clearly while at the same time realizing just how far away it was. This is why the sneering charge of "walking simulator" always rubbed me the wrong way. If I transported you back to the past and let you revisit your childhood bedroom, I hope that later you would have something more to say about it than, "I walked around a room." The interactivity in this game was integral to the experience. 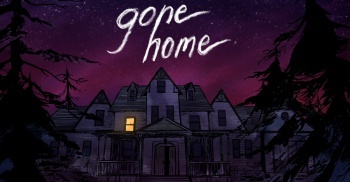 Gone Home couldn't work in any other medium. It would be torture to read page after page of detailed item descriptions, and even the best description couldn't evoke the flood of memories the way Gone Home does when you pick up a random item and turn it over to see some forgotten detail on the base. All of that magic would be lost if you moved it to a passive media, for the same reason that watching vacation slideshows isn't as stimulating as going on the vacation. The thing is, if you're not part of the narrow age band that this game is dealing with, then none of this will mean anything to you. If you're younger or older than me by more than a decade in either direction, then this stuff probably looks like random meaningless yard sale crap to you. The other thing that I really appreciated about Gone Home was how it handled homosexuality. Sam (sister of the player) is a lesbian, and the adults in her life don't know how to handle her. See, it would have been easy to look at this situation through the lens of 2013, portraying the adults as a bunch of evil homophobes. But instead the game was far more circumspect (and historically accurate) by showing them as well-meaning people who were confused, frustrated, and uninformed.